The Giant Asteroid has been found. 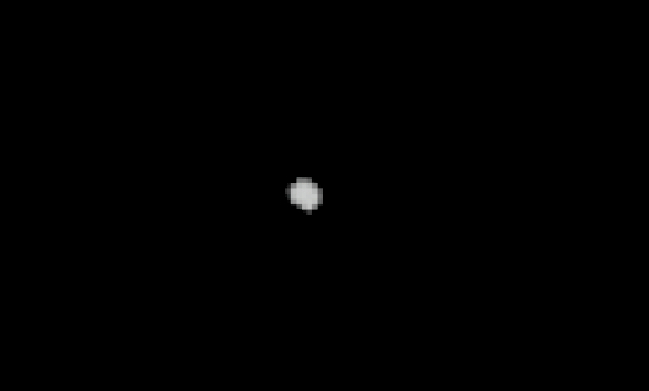 This zoom photograph is of the Giant Asteroid. It was deflected from Earth by a number of Nuclear Bomb Space Detonations in September*. This Giant Asteroid exhibits an unusual “bright flashing” phenomenon at rare moments. The cause of these flashes are from smooth concave formed solidified molten rock crater(s). This acts as a form of a directional “reflection mirror”. The smooth mirror like “reflectors” were created from the Nuclear bomb detonations on the Giant Asteroid. When the rotation of the Asteroid causes a one of these craters to align with precise Sun-to-Earth angles, a sudden brightening of Earth directed light will result. The intensity and size of the “bright flashing” phenomenon reveals the magnitude of the Nuclear Bomb(s) used to create such large craters. In addition, the existence of such large crater(s) implies the significant mass & size of the Asteroid to withstand the “intact” creation of these large craters from massive nuclear detonations on its surface. Any Astrophysicist would know that “natural” Asteroids wouldn’t have reflective concave mirror-like features imbedded within its surface. It’s impossible. Only a thermonuclear event, on the surface of the Asteroid, could create the molten rock & radioactive glass reflective crater. The Giant Asteroid was found through exhaustive searching of night skies along the trajectory of the Earth Ecliptic coordinates provided in updates. NASA still remains silent regarding this Giant Asteroid. This fact is astonishing since the main tracking trajectory and detonation identification* has been from NASA’s own internal telescopic data. NASA’s own markings on the hi-res telescopic data show that they were tracking this object. This “bright flashing” phenomenon should serve as a confirmation Warning in that it reveals that dangerously large fragments were ejected into space. Since the Nuclear Bomb Space Detonations occurred inside and outside of the Earth-Sun gravitational balance “Lagrange Point (L1)”, very large and dangerous fragments may spiral for many months before hitting the Earth. Our Blessed Mother confirms that this Giant Asteroid was deflected and would have been catastrophic had it collided with Earth**. NASA, through the Planetary Defense Coordination Office (PDCO), is seemly leading the public astray on NASA’s own internal knowledge of this Giant Near Earth Asteroid & the incoming dangerous fragments***. Note: specific information on date timing kept confidential for source reasons.